What Do The Best Vacation Rentals Have In Common? The insurance people, Geiko, have recently launched a video entitled The Best Airbnbs Have These Things in Common. So I thought that I’d enumerate them and see how our own listings (here in fabulous Fort Lauderdale) compare. We have two – both are in a wonderful mid-century modern waterfront complex. Personally, I don’t think that views get much better than the ones you’ll get here. Our tiny complex is located on a junction – no, not a traffic junction but where two of Fort Lauderdale’s famous canals meet. That means that we have the best views of the water. Some waterfront properties might have water views – a few yards of canal and then the buildings opposite – but we have truly expansive views. Watch the water traffic go by – gentle yachts, one-person kayaks, zoomy powerboats (restraining themselves though in our 4 MPH speed limit) paddle boarders, fishing craft, party boats … you’ll see it all. I did mention the mid-century modern design, didn’t I? This complex – of only eleven apartments – was designed in 1948 by a well-known architect. It was built the following year and considered very exclusive. Almost every apartment was a second home – owners were wealthy people mostly from Michigan. The building has all the stunning features you’d expect from South Floridian architecture of the era – and because domestic air-conditioning wasn’t yet available it makes the most of thoughtful features to make the most of the ocean breezes and the carefully created shade. Every apartment has its own designated parking space so there’s no hassle whatsoever from the moment you drive up. You’ll have driven along the famous Las Olas Boulevard to get here – and that is one heck of a great first impression. 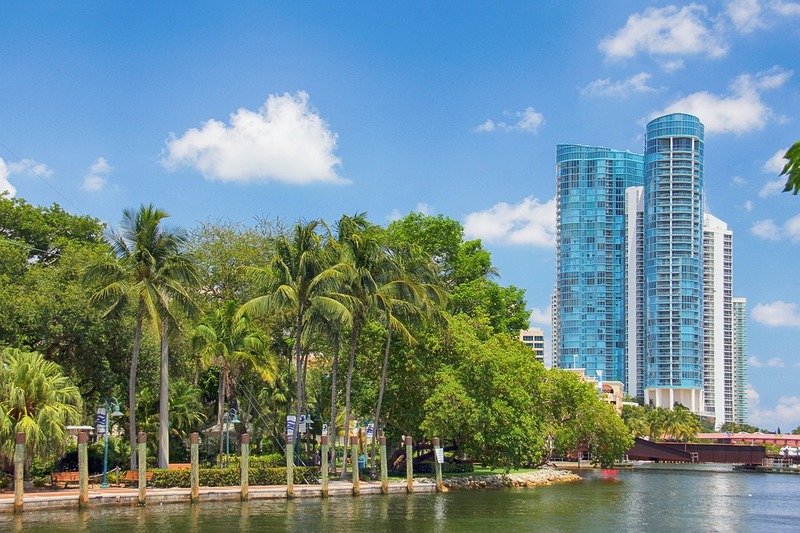 If you’ve driven east along Las Olas you’ll have travelled past some of the best restaurants, sidewalk cafés and shops in the world on this picturesque boulevard. If you’ve approached us from the other direction then you’ll have driven from the famous Fort Lauderdale beach past multi-million homes most of them with luxurious yachts moored outside. You are in the best area of Fort Lauderdale without a doubt and your apartment is so conveniently located. I’m trying to be modest here (okay, not too much) but we really do have the very best reviews. Our guests over the years have very kindly praised everything about the apartments and the extras we offer. From easy, trouble-free check in to their reluctant departure, our guests find that they truly appreciate this wonderful place. Many rate the location very highly as we’re walkable to the beach and all local amenities. Guests love to relax here although for the more energetic there are plenty of local opportunities for cycling, walking, watersports and generally exploring the South Florida area. Um … now I really have to be modest as I am your hostess, concierge and happy-holiday-helper. I love to meet our guests and show them their apartment and the gorgeous dock and outside areas they can enjoy. And I love to make sure that the apartment is in great shape for you. I live here year round and because I work from home, I am available during your stay in there’s anything you need. (But don’t worry if you prefer me to stay out of your way – that’s fine too!) I’ve lived here for many years so if I can give you any ideas about where to go or what to see, just ask. The apartments definitely offer you five-star treatment at an extremely affordable price. Both apartments are furnished with no expense spared – you’ll find everything to be the highest quality. The moment you walk in you’ll see the fresh flowers, the complimentary bottle of wine and the fruit that awaits you. You’ll find great quality toiletries supplied just for you (and a selection of ‘in case you forgot something’ items) and after your refreshing shower don your freely supplied disposable slippers and a soft & snuggly bathrobe. Curl up with a glass of wine and one of the latest carefully chosen magazines. This is the ideal place to relax. Sitting out on the dock with the beverage of your choice watching the water traffic go by is a perfect form of relaxation. Most of the apartments here are lived in year-round by their owners and we are very protective of our peace and quiet. Yes, quiet hours do apply, so please don’t book with us if you’re planning to be noisy. This street is a dead-end. Therefore we get no traffic noise. Sometimes, the loudest sound I hear all day is the noise of the parrots squawking as they fly overhead. So I think that we win in every category mentioned by Geiko, don’t you? You can see both listings linked from THIS PAGE. If you’ve any questions at all you’ll be able to get in touch with us via the page. We look forward to hearing from you – and to seeing you here soon!